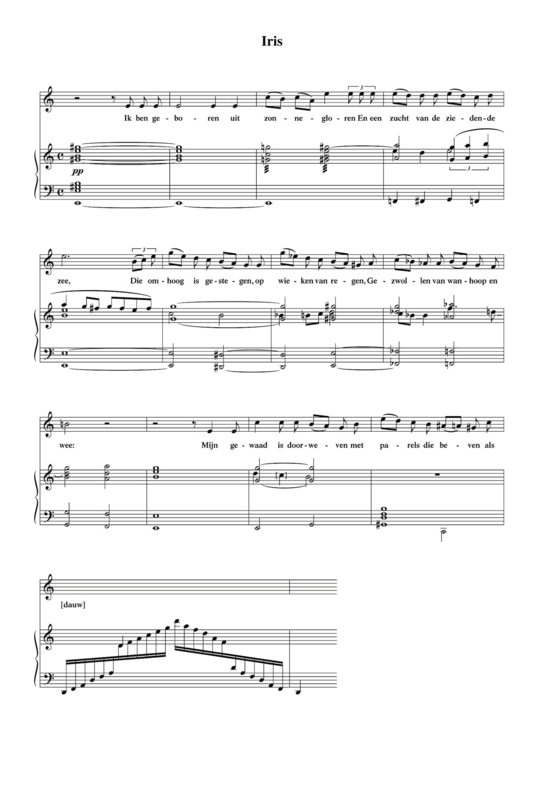 In spring 1903 Diepenbrock orchestrated the two songs for tenor on texts by Jacques Perk (1859-1881), which he had composed in April 1885 and March 1900: Avondzang (Evening Song, RC 13/59) and Zij sluimert (She Slumbers, RC 51/60). Later that year Avondzang is mentioned several times in Diepenbrock’s correspondence with his friends W.G. Hondius van den Broek and J.C. Hol. In this context it is not surprising that, after completing his symphonic song Vondel’s vaart naar Agrippine (Vondel’s Voyage to Agrippine, RC 64), Diepenbrock once again focussed on this poet who died at a young age and whom he considered to be one of the greatest of his generation. And although for a long time the composer had been planning to compile a cycle of Sonnets by Perk and turn it into a piece for voice and orchestra (BD V:276), he now took up the 64-line poem Iris. Its topic is the unattainable lover: Iris, the personification of the rainbow “born from the rays of the sun and a sigh of the seething sea”, longs to be together with Zephyr, but every time she manages to summon him from the sea, it is the gust of wind of his laugh that blows her away and drives her off to the realm of dreams where she can mourn her lover in solitude. The section that Diepenbrock wrote down on 16 November 1903 consists of 13 measures. It has a syllabic melody in which the ascending minor sixth is the main interval. The accompaniment is mainly chordal. Diepenbrock would have had strings in mind for the tremolo in m. 3 and possibly a harp for the final measure. Gezwollen van wanhoop en wee. Een waaier van vlammen ontplook. Van Zefier doemt lachend te voren. Waar ik eenzaam om Zefier kan treuren. Van weedom het wenen vergeet. En op ’t rag mijner wieken zich wiegt. Die mij achter de zon zal doen deinzen. En mijn droeve gestalte vervaren. Doch liefelijk lacht, als hij lijdt!